When their military base is overrun by hungries (humans infected with a parasite that turns them into zombies), several soldiers, a scientist, a teacher, and their unorthodox charge - a brilliant young girl, head towards safety through inhospitable terrain. The book is based on the novel of the same name by Mike Carey, who also wrote the screenplay. The basics of the story remain the same though there are numerous differences between the book and the movie, most of which deal with shortening the time frame in which events occur. Characters also don’t look as described in the book: Melanie is black instead of white with blonde hair and blue eyes, Miss Justineau is white, instead of black, Gallagher is black instead of white with red hair, and Sgt Parks is missing the ugly scar across his face. On the whole I was ok with their casting choices. While shortening the time frame is necessary to fit everything into a film, it has the disadvantage of removing a lot of the character development, which also removes a fair amount of the natural conflicts of interests that created tension in the book. Helen Justineau is less hostile towards Sgt Parks (and less feisty altogether, which was unfortunate), Gallagher’s background is never touched on, Melanie doesn’t keep the same physical distance and constant sense of self-awareness of the danger she poses to the others. Sgt Parks felt like the only character who showed growth, as his attitude towards Melanie changes. There’s a good amount of tension in the film due to the hungries and trying to avoid triggering them. Sennia Nanua does a remarkable job as Melanie. It’s a difficult role and she’s amazing in it. The character starts off a little irritating (being the only one in the class to answer questions correctly and the first to volunteer responses), but grows on you quickly as the film progresses. She’s alternately terrifying (when feeding) and sympathetic (learning the truth about the world). The film does good things with its zombies. They’re just different enough from the norm to be interesting, and how they came about is downright terrifying. The ending has changed a bit, but still has an emotional gut punch. The future it shows is bleak and there’s a definite I Am Legend feel to it. 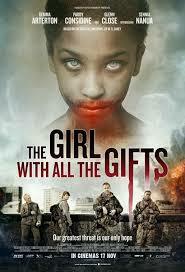 If you like post-apocalyptic or zombie films, it’s a good one.